Jack Jensen is an outstanding performer whose legendary voice gave the country music group The Rhythm Pals their distinctive sound. He has been called “a true son of British Columbia”, and is described by many as a generous person, a gentleman and a dedicated family man. Mr. Jensen has become one of Canada’s premier performers in the Canadian entertainment scene. Together with Mike Ferbey and Marc Wald, The Rhythm Pals began their career on Vancouver’s CKNW radio, and were one of the first Canadian acts to appear on U.S. television. They starred on CBC radio and television in their own series, Burns Chuckwagon, and were part of the regular cast of the Tommy Hunter Show for 17 years. With The Rhythm Pals, Mr. Jensen has entertained Canadian troops and United Nations Armed Forces in almost every part of the world. 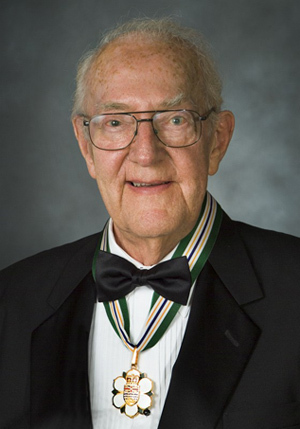 For over half a century, Mr. Jensen has shared his talent with generations of Canadians, contributing greatly to culture and music in our nation. Instead of retiring, he has continued to entertain for senior’s groups and nursing homes, and is actively involved in volunteering, fundraising and entertaining for charity. With The Rhythm Pals, Jack Jensen has won three RPM Awards (now known as Junos). He has been inducted into the B.C. Entertainment Hall of Fame, the Canadian Country Music Hall of Fame, and the Canadian Country Music Association Hall of Honour. He has received the Saskatchewan Legend and Legacy Award, and his name is embedded in the Starwalk of Vancouver’s Theatre Row.